The elusive and secretive ranks of the Ninja warriors also known as Shinobi were warriors in Japan, that specialised in covert war tactics that led these Ninja warriors to become feared and respected in equal measures. By the use of stealth and specialist weapons the Ninja warriors were masters at infiltration and espionage, studying their targets and then striking with pin point precision on their enemy. The ancient Ninja warriors were highly feared and rarely seen for good reason, the Shinobi were masters of their trade. Ninja were ancient warriors that hailed from Japan during times of war. The most common first mentions of Ninja warriors were in the 15th century during the ancient wars of Japan, but more than likely the Ninja was around before training in secret for when they were needed. When it comes to the name Ninja, this is most commonly the terms used in the West, in Japan the more traditional Shinobi is the common term, which means to steal away and of course suits perfectly the nature of the Ninja warrior. The early knowledge of Ninja warriors leads us to gather that, they were a secluded and secretive gathering of agents and soldiers. These warriors were hired to complete mission that ranged from spy work and scout missions to attacks focused on the element of surprise, to give the Ninja the upper hand in any form of battle. The Ninja were as organised internally as they were when it comes to completing a mission, they had a hierarchy of classes that would determine the Ninja rank and also the types of missions and jobs they were assigned. The lowest rank of Ninja was the genin who were used in scouting missions and were traditionally recruited from the lower class of the Japanese public. Next were the middle men of the Ninja, the chunin who were used as assistants to those above them, and would be more experienced and skilled in the arts but not quite at the top yet. Finally we have the jonin, the highest rank of Ninja who would carry out more important duties including recruiting and hiring out any additional resources that the guild would need to complete their Ninja missions. The Ninja warriors were masters of weaponry, and had such a diverse array of choices, that would be used specifically for the right mission or job they were planning or undertaking. From short range melee weapons to long range projectiles the Ninja arsenal was impressive and varied, and included such deadly weapons as the Ninja To, the Wakizashi and the Tanto. In battle the Ninja warrior would by wily and stealthy, but was always prepared for multiple situations and events that could occur. 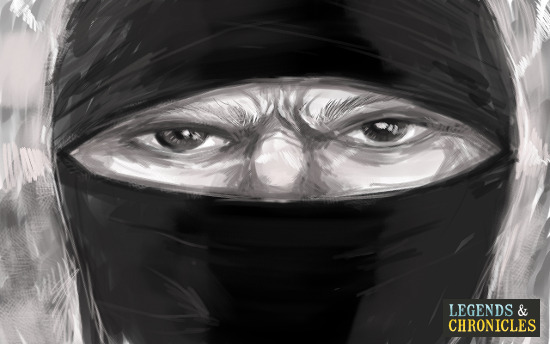 The Ninja carried many weapons and tools that allowed them to scale walls, enter building and then kill if required. The Ninja would also be careful to remain unseen and undetected, wearing dark coloured suits and concealing their features to remain unknown. They would even employ the use of wooden shoes with animal footprint shapes on them to not leave any human tracks to be followed. When it came to combat the Ninja warriors had a weapon for every situation, from close quarter melee weapons to long range projectile based weapons like shuriken which the Ninja would use as a defence retreat weapon when required. In essence the Ninja warriors were some of the most elite tactical warriors to ever exist. Their mix of skills, organisation and unrivalled tactics meant the Ninja were able to accomplish tasks and mission with an unprecedented level of precision and poise. Their clothing, weapons and training allowed them to perform tasks that other ancient warriors could not. The Ninja were unique and true specialists.